FIGURE 2: Immune suppressive functions of MDSCs are regulated by metabolic pathways in the tumor and glioblastoma (GB) microenvironment. The cartoon summarizes three major metabolic pathways governed by MDSCs: 1) FAO pathway through PPARγ and AMPK, 2) glycolysis through HIF1α and mTOR, 3) depletion of amino acids by enzymes and transporters. 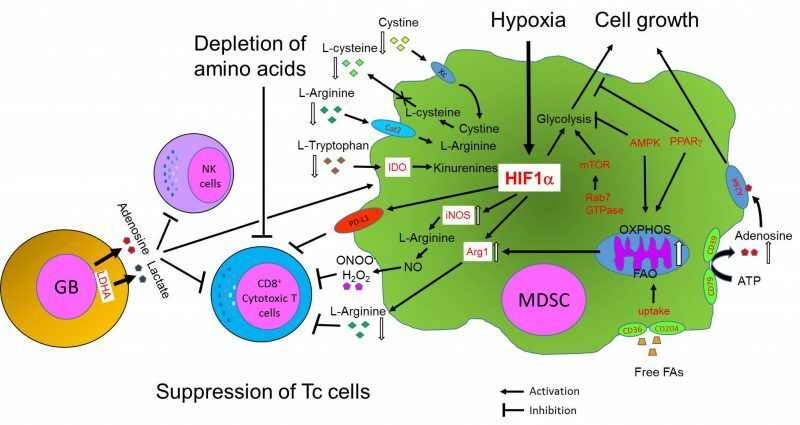 These metabolic pathways determine the fate and the immune functions of MDSCs. MDSCs and tumors also cooperatively control survival and anti-tumor functions of NK and T cells by tightly regulating levels of metabolites such as adenosine, lactate, toxic ROS or RNS, and amino acids in the TME. Factors in red indicate key regulators of metabolic pathways for immunosuppressive functions of MDSCs.